This is the one I'll show you with my tutorial pictures. I made this for a birthday present for a friend who LOVES french things! 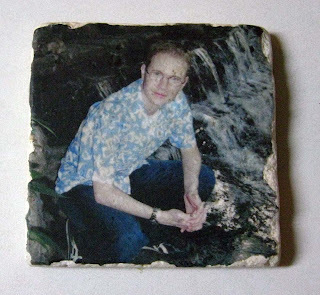 This is a 6" square tile. 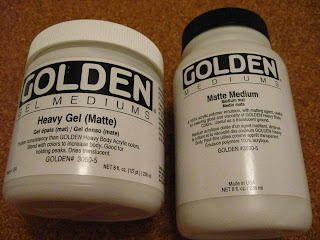 1 jar each of these: Golden Gel Medium (Heavy Gel Matte) and Golden Medium (Matte Medium) These will be the most expensive part of the list, but they will make a TON of tiles! I use my 40% off coupons for Michaels when I buy these. You'll find them by the canvas and acrylic colors. 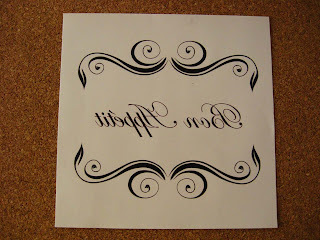 1 image printed backwards on a LASER printer. (Don't print it at home unless you have a laser copier. Most people, like me, have an inkjet printer.) Just print it out and take to a copy place and have them copy it for you. It doesn't have to be on a special type of paper, regular copy paper is fine. Ok, now you've got your supplies so let's get started! -Wash and thoroughly air dry your tiles. This will get off any dust from the tumbling process. 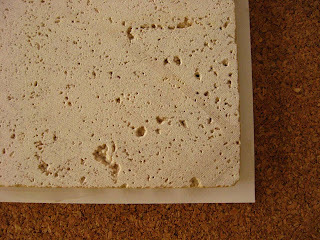 -When the tile is dry, paint the front, back, and all sides with a coat of the Golden Medium-Matte Medium and let dry. Your paper will probably curl up a little bit but that's ok. 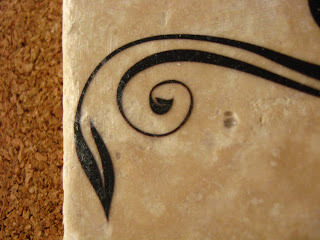 Turn your tile upside down and center onto your gelled up paper. By lining up the tile on the paper it's easier to center your tile with the image. After you've done that it's time to bake your tile. 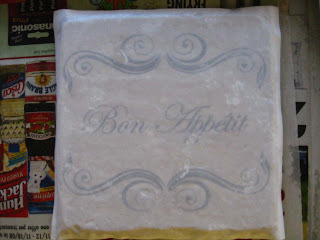 Place your tile (like seen below) onto your newspaper lined baking sheet. Put it into the oven for 15 minutes at a temperature of 200 degrees F. Basically what happens here is that the acrylic on the tile and the acrylic on the paper bake together and bring the laser toner with it. Next, transfer the tile to a work surface covered in scrap paper. Grab your sponge and a small bowl of water. 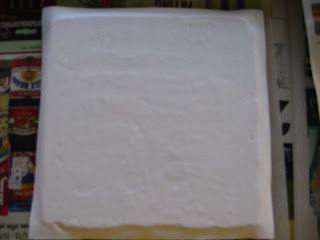 Get the sponge wet and start to wet the paper. You'll start to see the image come through when the paper is wet....we want to remove the paper and the image will appear! This is the fun part! 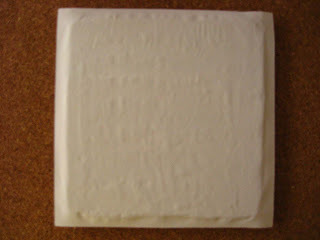 Here's where a few layers of the paper have been sponged off and you can see the image transferred onto the tile. Keep slowly removing the paper until you've got the majority of it off. Sometimes it helps to let it dry for a minute or two so you can see better where the paper still needs to be removed. If you look at the picture below you can see a few paper fibers hanging onto the black part still, it's where it looks a little cloudy. If it looks like this it's fine. 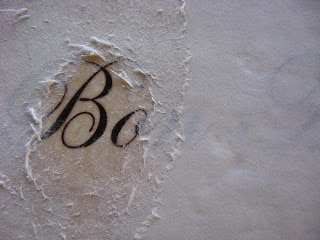 When we put the finished coat of acrylic on it, the few paper fibers left will disappear. *Notes on removing the paper: Don't rub too hard and make sure your paper is fairly wet. It doesn't have to be dripping, but if it's fairly wet it will make it easier to remove without damaging the acrylic layer. After removing all the paper and paper fibers, put another 1-2 coats of the Golden Medium-Matte Medium onto the tile and you've got a completed tile. This makes a great gift! Try printing out Christmas images or quotes to make holiday decorations for yourself too! 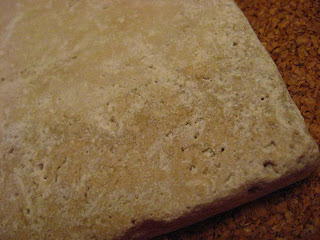 If you decide to do coasters, place a thin sheet of cork, cut to fit, on the back so they don't scratch your furniture. *Because the acrylic melts with heat, if you make the coasters, please don't use them with hot drinks. 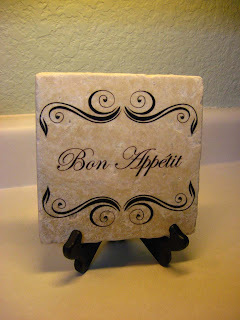 Also don't use them as trivets either or your image will be stuck to the bottom of your hot dish. If you have any questions please leave me a comment and I'll respond and try to clarify anything that may have been confusing. Oh how fabulous, I love these! I'll be linking. I haven't used it but there's lots of tutorials if you search. If you contact the company directly they could probably tell you if the transfer is heat sensitive or not. Can you tell me where to get the decorative sayings? Thanks Erin... I'll check out the Lazertran product. Looks like fun! Just wanted to tell you I have just spent the entire morning looking at your blog! Love all of your tutorials...your cards and decor are the best! Ok, so I just did your tiles, and the paper isn't coming off...to make it worse, the bottom layer (matte mediium) is coming off when I rub the paper. YIKES! Any tips?? To answer your earlier question. I made my own decorative sayings. Usually I just put some sayings in a decorative font I like, size it correctly, and print it out. You can use Photoshop or Microsoft Word for this. Just make sure you print it backwards so that it will transfer correctly. Thanks so much for explaining this. I was wanting to make some more and couldn't remember a couple of steps. Thanks so so much for your tutorial! I had spent lots of money on other options and tried this one tonight! worked like a charm! thanks for sharing your wonderful technique! 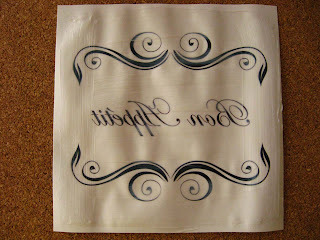 Do you think Modge Podge on the finished tile would help keep the image from transfering onto the bottoms of hot cups? I love this idea and I think I now have a go to DIY gift for my crafty friends! I have not tried modge podge. I would be worried that any heat would melt the layer, even if the modge podge was on top. I'd try it on a sample tile and old mug before making a lot of them. I may play around with this a little more and experiment with this! Thanks! I'm glad you like the tutorial! I'm guessing I should know the answer to this but how do you make the words print backwards? Is that a function of Microsoft word? If I have a saying I want to use and it is in image form I am not sure how to flip that backwards. I love this idea and want to try it! When the menu box pops up, just go to your Printer Properties and choose a setting called Mirror Image on. Each printer will say something slightly different, but you'll want to just mirror the image and it should print backwards with no problem! Wow... I LOVE your website. These tutorials are awesome! I'm definitely going to have to try this out. Just one question... what is a "brayer"? Do you think this would work on a textured wall? If so, would it ever be removable? Elisa and Morgan- Due to the heating process involved I think it would be difficult to do on a textured wall. I'm not sure how you could do this transfer on a wall. Thanks so much for asking! Sorry I couldn't help you more! 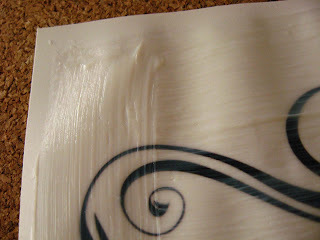 If you don't have a brayer, I have used the back of an old spoon and it seems to work fine. Also, I agree with you -- using your dampened finger to remove the paper works better than a sponge! I have not tried the heat method before, it looks really interesting. Can't wait to try! Thanks for writing out this tutorial, and for all the GREAT pics!!!! Just wanted to add that if you use clear engine enamel spray to finished product and allow a week to cure, it will dry hard and protect against heat up to 500 degrees. You can buy at AutoZone. 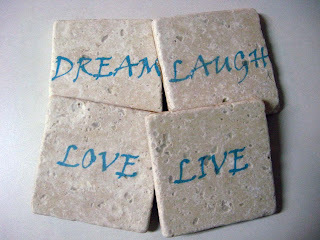 I am very happy to contact to landmaark why because they had provide quality marbles and tiles. Marble tiles are very clean looking good and superb. Landmaark is the best company about fitting dealers and flooring tile dealers. Landmarks is the top company in Bangalore to sell the materials, marbles, tiles cement etc. I can't get my printer to print backwards. The option is not there. I printed it out as is. Can I take to some copy place to relax reprint?? I really want to do this help! !